The Gentleman Crafter: Happy Birthday Mom! 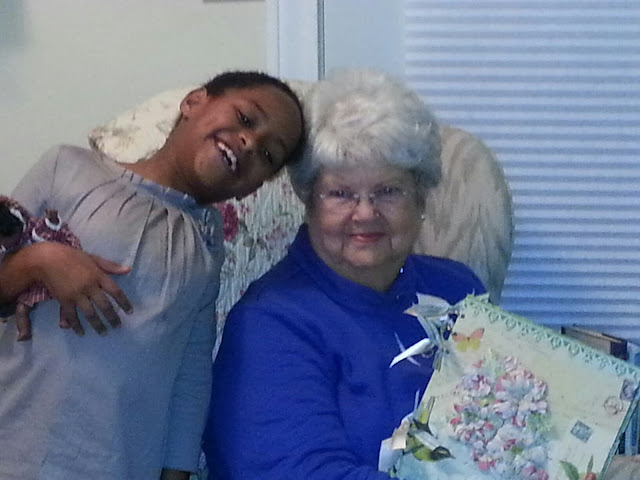 Today, February 18th is my Mom, Nell Trotter Hankins Birthday! I am so honored to do a little tribute to her on this fine day. You know, my mom has been an amazing person in my life. She has always been there for me and has always believed in me. That truly is the coolest thing ever. Sometimes she had to shut her eyes and just pray that I would make the right decision and then there were times when she just had to tell me what the right decision was! LOL! A very compassionate person who has a dictionary for a mind. If you ever need to know how to spell something or what something means, she can readily hand you the information! She loves history, is an avid reader and does handwork to fill the time when she is not volunteering. Every gray hair in mom's head was given to her by yours truly. What can I say, I was the black sheep in the family! LOL! I wrote to her today in a card, that when I was a kid in elementary school, there was no better feeling than to look up after school and see her sweet face standing there waiting to walk me home from school. She and I have always been "Pals" as we used to say, and we would would walk and talk about what I did in school that day. Once home, we shared Eskimo pies...You know those ice cream treats...Just because she knew how much I loved them. ...Now to me folks, that's a mother's love. 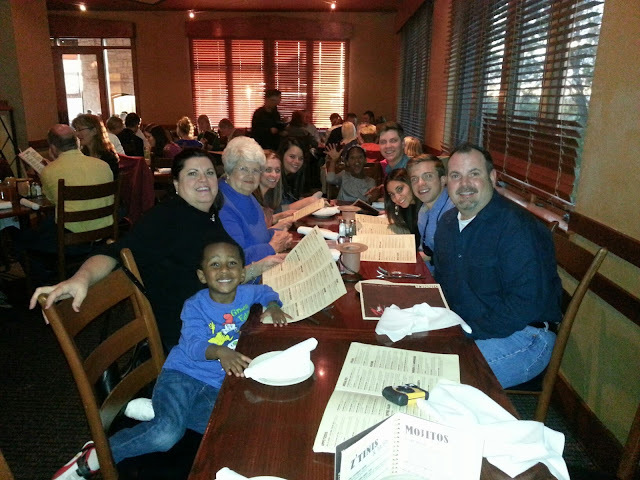 My family came into Austin to take "Granna" out to dinner to celebrate. The true miracle here is that we found a day we could be together all in one room. So good to be with everybody and to celebrate this very important day. 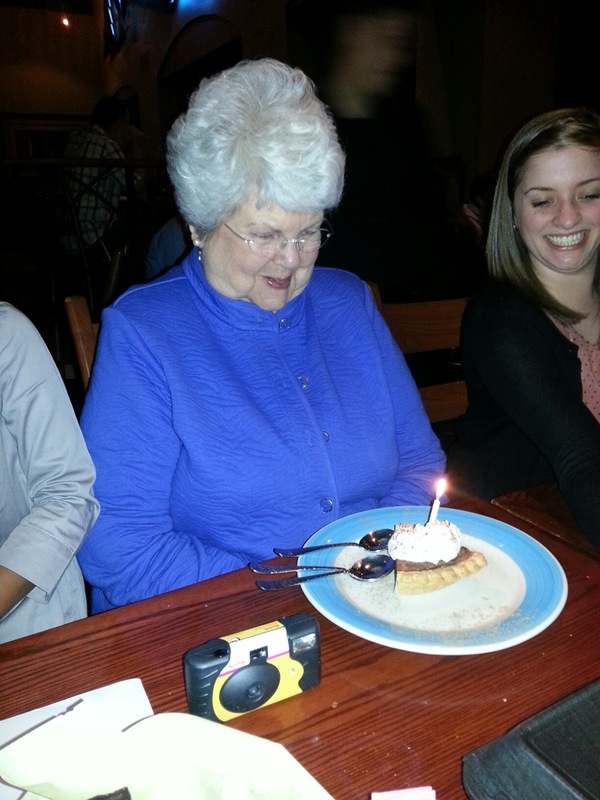 Granna and her infamous throw away camera! LOL! BTW, I just want to take a second to thank all of you who helped me though suggestions, guidance and just plain old company on Ustream yesterday as I made mom's Greeting Card Organizer. She loved it...But I have to say probably her favorite gift of all was the book I made. Not so much the book, but it's contents. 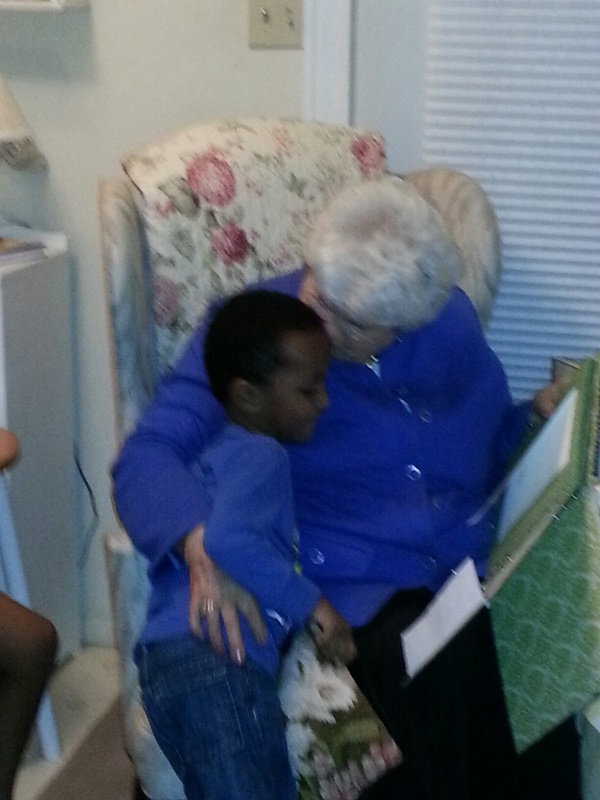 A letter from each one of us sharing how mom touched each of our lives. Each one had their own page and it really turned out to be a real beauty. Did I take one single picture of anything I made? NO!! LOL! Completely forgot...However, here is a snap of her looking at the book which sent me trying to find the tissues for the tears that ensued. Finny Giving Granna some Lovin'. Happy 80th Birthday Mama! I love you so much! Your Mom is truly special, and she raised a special son (not to mention the daughters--LOL!). And sometime when you are visiting your Mom, you can take those pictures of her presents--I'm sure they will be right out on the coffee table! 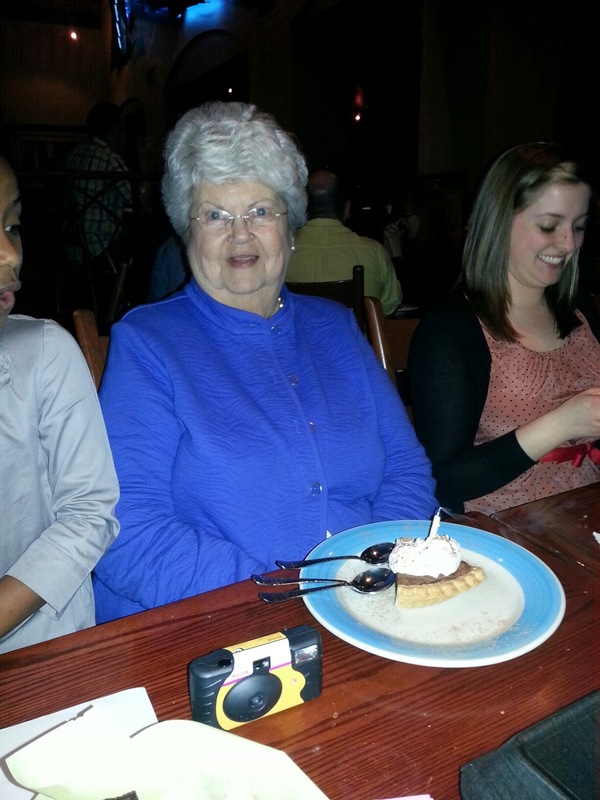 And a Happy 80th Birthday, Mrs. Hankins! Happy Birthday to Momma, I could sit and watch your Mom craft all day, so made me laugh. She looks to be such a beautiful person inside and out.. I always say that if a man honors his mother, he will be equipped to handle life. This is true of you. Your public acclamation of love and honor to your mother is very touching and heartwarming. I am sure she is very proud of the man you are now and the talent you have for making beautiful creations. Your contributions to our art community around the world are profoundly impacting the artistic nature of you followers. I count myself to be privileged to be a part of the group and look forward to becoming better acquainted with you. AND Happy Birthday to your mother ! A HUGE Happy Birthday to you today!I hope your whole day is filled with balloons and goodies and joy. I hope to see you crafting with Jim again real soon. It's a delight to watch. 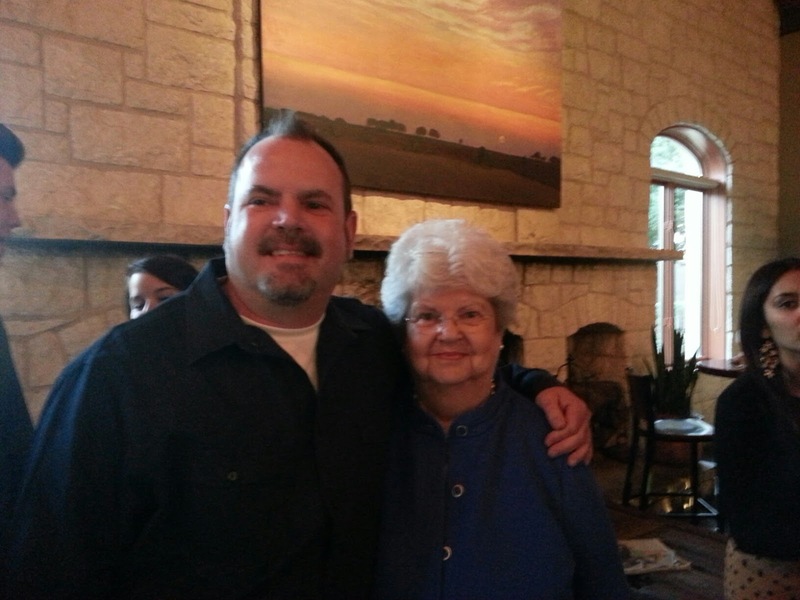 Happy Birthday to Jim's Mom - and thank you for raising such a sweet, kind, funny and incredibly talented son! He is such a credit to you and you must be so proud. Jim, it was fun joining you on Ustream last night and the box that you made for your Mom is gorgeous! What a loving tribute to a wonderful lady. So glad you honored her here, Jim. Happy birthday to a truly lovely Southern lady! Your son may think he's the "black sheep" of the family, but we all think "you done good!" Happy birthday Jim's mom! Sorry I missed you yesterday, will have to watch the recording!!! Love the idea of your book....what a special treat for her!! You done good! Jim, What a great tribute to your mom! Isn't it fun to look back on all the good times. Happy Birthday Mrs. Hankins!! Thanks for sharing your celebration with us. Did you record your u-stream yesterday? I can't find it. I'm looking forward to Tues. night, see you then. wishing your lovely mum a very happy birthday and I am sure she has enjoyed spending the time with you all together. What a wonderful idea with the book so personal but a true keepsake. Sounds like you have an amazing mum. Wishing you a very Happy Birthday Mrs Hankins. Looks like you had a wonderful day spent with your entire family and I know you will treasure your special book forever. It's lovely to read all that Jim has to say about you. Happy birthday to your lovely mom! What a beautiful family you have. What a lovely tribute to your mom. She is very, very lucky to have such a wonderful son. Jim what a lovely words for a great Lady. Mrs. Hanking a very Happy Birthday. Very sweet Jim....do you justice to your handle "gentleman" and obviously it was your mother who raised you to be....HAPPY BIRTHDAY MOM! Happy Birthday to your Mom! Wonderful tribute to a special lady. OMG JIM.....DID YOU NOT RECORD YESTERDAY'S SESSION!.....first of all I missed it as I was not expecting you to have one and didn't see it on your blog unless I missed reading it......now I run and check and their is no video from yesterday!......phooey! I must say... Reading about your Mamma has given me a tear in my eye also. She is such a special woman! You really lucked out Jim, she is awesome. I know she feels the same about you too! (It shows in your family project video's!) Happy Birthday to your Mamma! I hope you have a fabulous week! Hugs! God has blessed you both, real good!! Happy Birthday lovely lady, and thanks, Jim, for letting us share a piece of this happy day! As always, your creations are magnificent. SO SO Sweet!!! You are a good son!!! She is just beautiful Jim...inside and out! Precious post! Happy Birthday Jim's Mom .. you can see her kind spirit in her smile. You know she's special when so many people gather to celebrate her. There is no love like a mothers love :) Love the book, it looks beautiful ! Those are the best gifts .. the ones from the heart and hands. Yay..... Happy Birthday to Jim's Mamma!!!!! It looked like she realy enjoyed herself. It looks like you all Made it a special day for her!!! Jim, momma sounds like she truly deserves the title of Momma! I know she treasures the book you made above all else. I still have in my bedroom a felt floral bouquet my kids made, each petal with a note from them about a difference I made to them -- they were late teenagers at the time so you probably appreciate how significant it was! Oh Jim, you brought tears to my eyes! You are an awesome son with an even more awesome mom! Happy Birthday to your mom! Hi Jim, As one of those naughty bloggers that reads all your postings & gets inspired by all your amazing projects, but rarely comments, I just wanted to say thank you so much for all your hard work. I do appreciate it. The reason I'm commenting today is that I couldn't go without wishing your Mom a fabulous birthday. She is one amazing lady. Thanks for sharing her with us. Happy Birthday Mrs. Nell. May your day be filled with much love and many blessings. What a loving tribute to your loving Mother. You are so lucky to have her with you, and you realize that, which is commendable. Thanks for sharing her special day with your followers. Happy Birthday to Jim's Mom! May you have many, many more! Happy, HAPPY BIRTHDAY, Mama!!!! WISHING YOU THE VERY BEST!!! Your son has blessed my life is so many ways!! It would never have happened if you hadn't raised such a thoughtful and caring man. Today is also the birthday of a very special lady...my dear daughter, Kimber...she's almost Jim's age...so you know how old I am...LOL!!! Wishing your mom a very HAPPY BIRTHDAY!! What a beautiful tribute to your mom! Her love and devotion definitely helped to rear a kind, generous and extremely creative Gentleman Crafter-- and we all are grateful to her for that! What a blessing you both are! 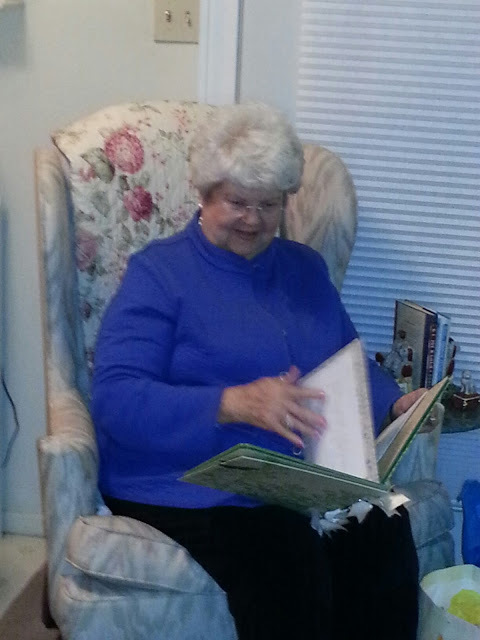 My mom just turned 90 on the 13th of this month and we all did something similar, making her an album with love letters and memories from all of her children, grandchildren, great grandchildren, nieces, nephews, old friends, etc. What fun it was to go down memory lane and make it for her. I can only imagine how much the book you made your mom meant to her! Wishing your mom many more years of love, happiness and good health! Happy birthday to Momma. My mom always had a disposable camera too! Happy Birthday GC Jim's mom! Wishing you many more wonderful years with your awesome family! Happy Birthday to Momma! Thank you for sharing such wonderful photographs. There is nothing better in life than a mother's love. Wishing your mom happy birthday! I still loved watching her in your craft room! Glad you got to spend the day with your family to honor her. Your momma raised a wonderful son just by seeing how much you love and honor her. Awesome Idea for a gift. I may have to make one for my mom sometime!! Love the idea of everyone writing a page (we are a big family so it would be an encyclopedia. Thanks for sharing!! Happy Birthday Mama! What a wonderful way to celebrate....seeing many of your accomplishments in one room. You are truly blessed. Jim, your Mama is so stinking cute too! I am so sad I missed the Ustream yesterday. I had so much fun last week and I am not sure if I can make tomorrow's. I have Mom duties, but I am going to try really really hard. And you give me hope that my son will appreciate all the years I walked him to and from school when he is 40+! Happy Birthday to your Momma!! She looks like one special lady. You are a very lucky man! Happy Birthday Ms Hankins! And many many more!! Happy, happy birthday Mama Hankins. Hope you have a great year. Jim, thanks for sharing your mother with us. PS. Hope you record your Sunday sessions. Just hanging would be awesome if I get lucky enough to catch when you are on. thanks as always for sharing. HAPPY BIRHDAY TO YOUR BEAUTIFUL MAMA......you are soooooo blessed Jim!!!! Hope you all had a great day celebrating! Happy Birthday to your Mom, those photos are awesome, looks like you had a wonderful time.